Chris and I are really trying to eat more fish in our diets. I have an upcoming doctor appointed the first week of December and I always want to do a good job on the test results. 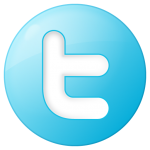 I do not enjoy lectures from the doctor and would like to eliminate the possibility of any additional medications. Sometimes it is better to join him then trying to beat him and the lab results never lie. This night Chris was preparing Tilapia with polenta and garbanzo beans, with fresh asparagus and pine nuts. I wanted to pair the meal with a nice light white wine and after pulling many whites I came across a bottle of 2012 Ladera Sauvignon Blanc. Pale color depth with an amber hue. 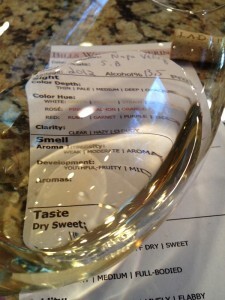 The Sauvignon Blanc was very clear. The Sauvignon Blanc was aromatic and fruity. I could smell pears, apple, and a slightly grassy nose. It was slightly sweet and light-bodied with lively acidity. There were no noticeable tannins and I am sure the wine was mostly fermented in stainless steel. I could taste soft pears and slightly creamy. The finish was medium but persistent. 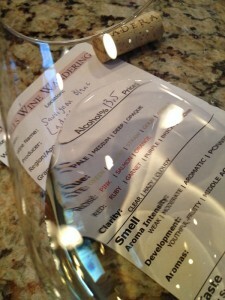 The 2012 Sauvignon Blanc is a blend composed of three Sauvignon Blanc clones: Clone #1, Sauvignon Musque and Liparita. 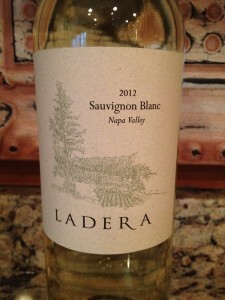 I really enjoyed the 2012 Ladera Sauvignon Blanc and rated it three glasses. The wine paired very well with the meal Chris prepared.